Five ingredients! Just 20 minutes! These creamy peanut butter truffles are a winner for sure. Thanks, Denny Gross of Troy, Michigan! Line cookie sheet with sides with waxed paper. In medium microwavable bowl, microwave vanilla baking chips on High 30 to 60 seconds, stirring once, until melted. Stir in peanut butter, frosting and whipping cream until well blended. Spread sprinkles in small shallow dish. For each truffle, roll 1 rounded tablespoon peanut butter mixture into a ball. Roll in sprinkles to completely cover; place on cookie sheet. 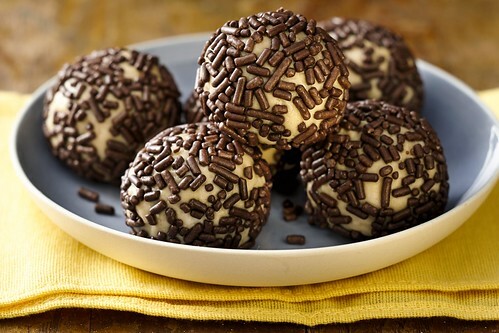 Refrigerate truffles 10 minutes before serving. Store covered in refrigerator.